One week until Corvair College #36 sign up ends. The sign up period for Corvair College #36 in San Marcos Texas April 1st-3rd, ends one week from tonight, but it may fill up before that. If you are thinking of attending, no is the time to sign up: 2016 Corvair College registration pages. Last week saw the arrival of $25,000 in machined Gold system parts from our CNC machine shop. This is the same one which has made every prop hub and gold oil system part we have sent out for the last 15 years. This shipment includes a large number of #2802 Gold oil sandwich adaptors. If you have one of these on back order, it will be shipped shortly. By Monday night, we will have computerized all of our existing orders. This means that our whole order system, both existing and new, will both be on the database. You can read about this here: Outlook 2016, New order page and distribution method. If you have an existing order, feel free to contact us through the new system, please be sure to share both your shipping address and phone number. Above, A photo from Corvair College #22, our first college in Texas with Kevin and Shelley. 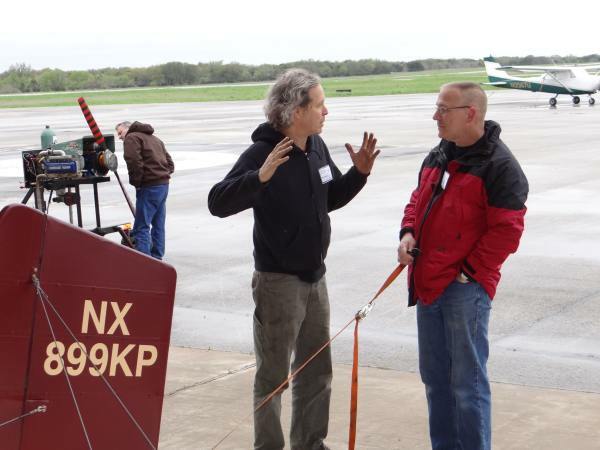 In the picture, Kevin and I talk policy by the tail of his Pietenpol, while Greg Crouchley from Rhode Island eyeballs an engine on the test stand in the background. CC #36 will be the fourth college that Kevin and Shelley have hosted.